Our mission is to provide IT leaders with the insights, challenges, and opportunities from strategic CIOs whose IT organizations provide innovative solutions by leveraging information and technology to improve the competitive position of their companies. Our goal is to help IT leaders improve the strategic maturity of their IT organization by enabling business outcomes that improve revenue, reduce cost, and enhance shareholder value. Phil Weinzimer, President of Strategere Consulting and Founder of The Strategic CIO Forum has collaborated with Computer Aid, Inc. to provide a series of thought leadership initiatives for the IT community that focus on improving the business value IT organizations provide the business enterprise. sessions. The event was very well-run." wonderfully implemented and exceptionally performed. Emceeing and for selecting the impactful speakers. and for the value added to my professional career!" insight into what it takes to be a true 'Strategic CIO'. discussion and selecting a great group of speakers. participating in future events. Great job to Phil and CAI!" it very thought provoking and interesting. I'm already looking forward to the next one!" significantly enriched the forum’s value." The Strategic CIO: Are You and Your Team Ready? 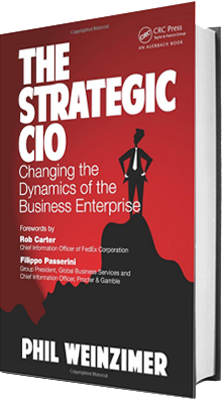 I didn’t know what to expect when Procter & Gamble CIO Filippo Passerini agreed to be interviewed for my book, The Strategic CIO: Changing the Dynamics of the Business Enterprise. The State of Georgia saved millions of dollars in project costs by implementing processes and a tool that enables the Project Management Office (PMO) to manage projects proactively, identify key predictors for project success, and create an effective team environment among key stakeholders. Working with clients to develop business and IT strategies that focus on achieving business outcomes. The Strategic CIO: Changing the Dynamics of the Business Enterprise provides insight, success stories, and a step-by-step methodology to transform your IT organization into a strategic asset that drives customer value, increases revenues, and enhances shareholder wealth. Stay current with all things THE STRATEGIC CIO.